SculpSure is the latest fat-removal treatment. This non-surgical fat removal system has the ability to reduce up to 25 percent of fat in the treatment area. Those in Folsom and the greater Sacramento area have the option to seek out this treatment from our well-respected local practice in Folsom. Who Is An Ideal Candidate For SculpSure? SculpSure will work on any patient and will kill the fat cells all the same. The ideal patient is one who already leads a healthy lifestyle but can’t seem to burn fat in specific areas, such as on the stomach or flanks. SculpSure may be right for you if you do not have loose skin but do have areas of soft fat. Schedule a SculpSure consultation with Dr. Liu to determine the proper treatment plan for your body type. Different patients will require different numbers of treatment, depending on how much extra tissue they want to eliminate with this procedure. These patients will generally achieve the result they are looking for in 1-2 treatments. Patients with a higher BMI may require more treatments, again, depending on the desired results. Are Maintenance Treatments Needed To Keep Your Results? 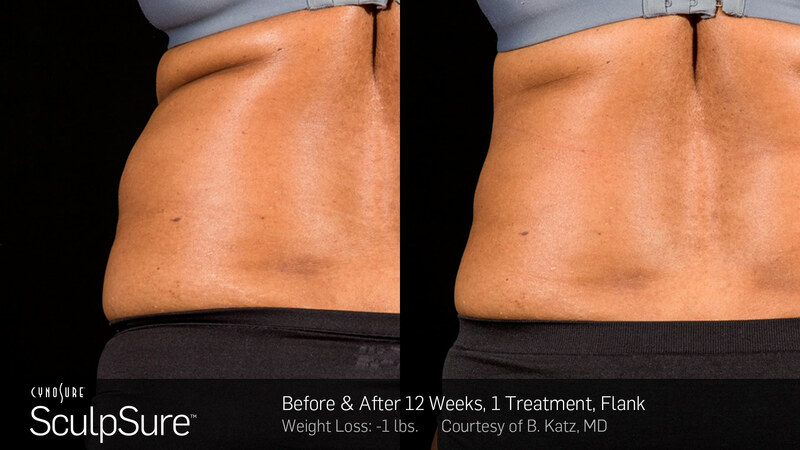 SculpSure produces permanent results. Fat cells do not regenerate so you will not need “maintenance” treatments in the future. There are steps you can take to optimize your SculpSure results post-treatment. Not only will these tips help you achieve the best results, they’re also healthy living habits. What Areas of the Body Can Be Treated with Sculpsure? We have used SculpSure for under-arm fat, thighs, calves, buttocks, and even “bra-fat” with great results. Additionally, the laser energy encourages the production of elastin and collagen, which help to tighten the skin and give it a more youthful and healthy appearance. What Does the Patient Experience During the Treatment? The patient will have up to four applicators placed on his or her stomach. The physician applies a lotion to the skin, which shields the epidermis from direct contact with the laser. A brief warm up occurs followed by the laser treatment cycles, with intermittent periods of heating and cooling. The doctor remains in the room the entire time, so the patient has the ability to express discomfort and the laser energy to be adjusted during any point of the procedure. Each treatment tends to take around 25 or 30 minutes. What Kind of Results Can the Patient Expect to See? Patients have reported losing multiple inches of fat from the procedure. It’s the ideal way to get rid of fat deposits to boost confidence, get a flatter stomach or jump start a diet. SculpSure is FDA-approved and safe for those looking to eliminate excess body fat. It’s non-invasive, which means no incisions, no anesthesia, and no risk of infection. How Long Does It Take To See Results After SculpSure? Patients will start to see results as soon as 6 weeks, with the full effect to be achieved at 12 weeks*. Some patients see satisfactory results from only one treatment; however, often more than one treatment is necessary for an average-sized area. How Long Should Patient’s Wait In Between Getting SculpSure? The recommended time between treatments is 6-8 weeks. If there is some mild swelling in the treatment area at 6 weeks, Dr. Liu might recommend the next treatment be performed 12 weeks post-treatment to achieve optimal results. Although results aren’t comparable to surgery, patients who undergo this laser fat removal procedure don’t suffer from severe scarring or serious complications. The patient may have redness, swelling, sensitivity, some irritation or tenderness at the treatment site. Infection or an allergic reaction is possible but very rare. For most patients, the procedure doesn’t cause any–or only slight–discomfort. Patients can resume all normal activities immediately after the procedure. There is no downtime with SculpSure, so patients can resume their normal activities following the treatment. What’s the Difference Between CoolSculpting and SculpSure? Both SculpSure and CoolSculpting rely on temperature to kill fat cells. Both procedures bring the internal temperature of the fat cells beyond the range where the cells can survive. What’s the Difference Between Losing Weight vs. Losing Fat? When you lose weight, you are causing your fat cells to shrink as your body consumes the stored fat for energy. When you lose fat cells through treatments like SculpSure, getting rid of those fat cells by eliminating them from problem areas. Is SculpSure Safe for New Moms? 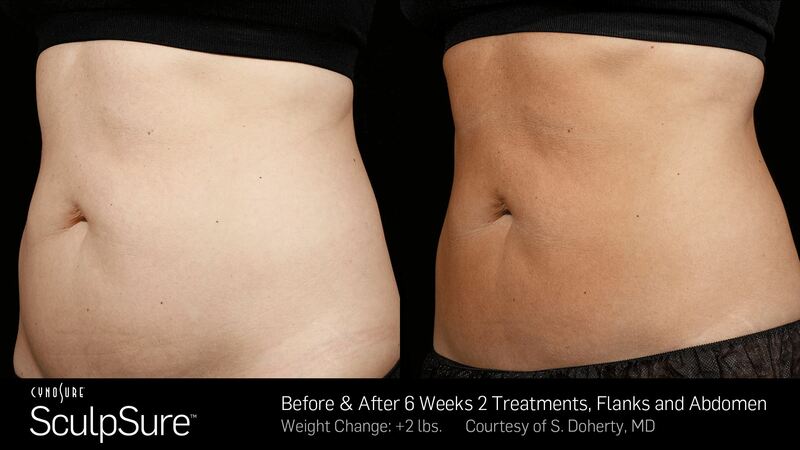 SculpSure is a safe, effective way to eliminate excess fat you may have developed during pregnancy. These laser fat treatments are the perfect option to pair with healthy eating and exercise for your ideal body. If you’re looking for the best method to manage problematic fat pockets, SculpSure offers three distinct advantages to post-pregnancy patients. If you have more questions about SculpSure, schedule a consultation with Dr. Liu to learn more about how the procedure can help you reach your health goals. * Note that an individual’s results will vary.